Following the death of the Austrian philosopher and spiritual scientist Rudolf Steiner in 1925, Ita Wegman - one of his closest esoteric pupils - began to publish regular letters to the members of the Anthroposophical Society. In Steiner's tradition, these letters were appended with "leading thoughts" (or guiding principles). Esoteric Studies collects many of these "letters to friends", together with various articles, reports and addresses by Ita Wegman on subjects such as the Christmas Foundation Conference, the Goetheanum building and the festival of Michaelmas. Featuring an informative foreword by Crispian Villeneuve and a commemorative study by George Adams, this book provides a fine introduction to the work of Ita Wegman, as well as a rousing call for courage and wakefulness in the spirit of the Archangel Michael! 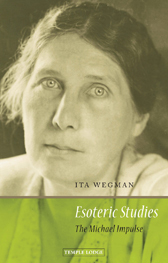 ITA WEGMAN, MD (1876 - 1943) was co-responsible for founding Anthroposophical Medicine alongside Rudolf Steiner. Born in the Dutch East Indies, she trained in gymnastics and massage and later medicine. She founded the first anthroposophical medical clinic (now the Ita Wegman Clinic), created a gentle form of massage therapy (Rhythmical Massage), and developed a cancer treatment following indications from Steiner based on mistletoe (Iscador). She also founded a therapeutic home for mentally handicapped children (Haus Sonnenhof) and co-founded a pharmaceutical laboratory (Weleda), that is now a major producer of medicines and healthcare products. In 1923 Ita Wegman joined the Executive Council of the newly reformed Anthroposophical Society at the Goetheanum in Dornach, Switzerland, where she directed the Medical Section. Wegman and Steiner co-authored Extending Practical Medicine, which gives an introduction and theoretical basis to Anthroposophical Medicine.